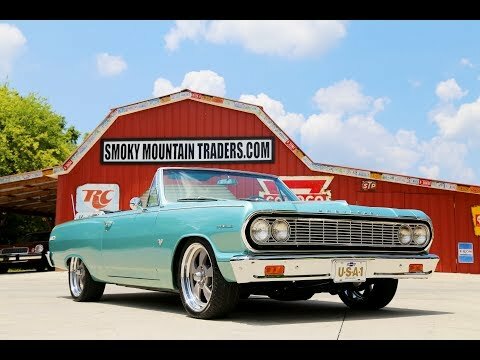 Up for sale we have a 1964 Chevrolet Malibu Super Sport Convertible. This car has undergone a complete frame off restoration that we have photo documentation of. The body is rock solid as it was media blasted after being set off the frame. Down the sides are arrow straight with the hood, trunk and door gaps all being great. Everything is covered in the Azure Aqua which is the factory color for this Chevy. The paint has been buffed and polished to a deep rich shine, and when you look in the jams you'll see they look excellent. To accent the Aqua a new White Convertible top that is power was installed. All the Chrome and Stainless on this car is excellent. What wasn't replaced has been cleaned, polished, and is like new. Also, the glass is all like new with the side glass having a light tint. All the weather stripping was replaced along with the new window felts and seals. To finish off the look it's sitting on a set of 18” and 20” Billet Specialty Wheels with Venezia Crusade HP tires. On the inside, it's also done in the factory options with the Medium Aqua color scheme that complements the exterior perfectly. It does have the bucket seats with the center console. The seat covers were replaced and all the padding is like new. Also, the door panels have been replaced and are still like new as well. Looking at the dash you'll see the pad was also replaced and that it has the correct SS gauges that are all working with exception of the clock. Every piece of trim on the inside is just as nice as the exterior. This '64 still has the factory style AM radio and heater controls. Under the hood everything is detailed very nicely with the inner fenders being satin black along with the firewall. It features a 327 Engine that is painted orange and set up with the correct style intake and Rochester 4 Jet Carb. The engine is mated to the Two Speed Powerglide and 10 Bolt Rear End with 3.08 gears. This was a factory Power Steering and Power Brake car that has had the Booster and master Cylinder updated to work better with the front Disc Brakes. Under the front new lower control arm bushings, end link bushings, sway bar bushings, and new lower ball joints were installed. New Brakes lines have been installed along with a new fuel lines and a new gas tank. This is a frame off car and all the of the frame and floors appear rock solid with the driver rear floor pan appearing to be patched.